First thing that happens in my day (Usually – sometimes there are exceptions.) is some quiet time with coffee / protein cocoa, and listening to the Daily Audio Bible. Throw in some crochet, and that’s when God has the most of my undivided attention that anybody’s ever gonna git. But what I’m wondering is, if that morning time makes me think that it kind of opens a “God Umbrella” over the whole day. Since I started the day focused on Him, that kind of means that He’s involved for the rest of the day, right? No need to stop, refocus, and specifically invite Him into whatever I’m messing around with at the moment, right? Automatic God inclusion in everything, kind of like Deus ex Autopilot. Nope. Not gonna say it, lest the ire of the Proofreader be invoked. She already reminds me in her totally-indoor voice that there’s way too much Calbert-bashing going on in that little noggin of mine. So, not gonna go there. You are welcome, my Proofreader Peep. So am I the only one that tends to forget that little thing – I need to actively refocus, to invite, to include Him in what’s going on right now, this moment, this specific activity, those wayward thoughts, that distracting vision across the room or on the screen? Or do I see others meekly nod their heads in affirmation of getting gollywhomped by the grind of a day, and forgetting the One who wants to hold our hands through it all? Honestly, peeps, it’s something I “know,” but don’t “remember.” I understand the need, but almost never put it into practice. And so, I sit down to write what He wants me to write, while utterly forgetting that in order to write what He wants me to write, I probably should invite Him to sit down at this table with me, ask Him to get involved, and thank Him for His presence, even when I forget or ignore Him. How do I expect to write His words, when I don’t make it a point to be listening? In His faithfulness, He usually shows up, takes an active role, and jumps into my wandering thoughts. He gently guides the words, the ideas, the expression, and as my beloved says, “the maintenance gets done.” My mind becomes a tiny bit clearer, the truth and the lies are separated a bit farther apart, and I become a bit more of what He intends me to be. But what if I turn to Him, right from the start? What if I extend the invitation? I know this – He’ll always accept. 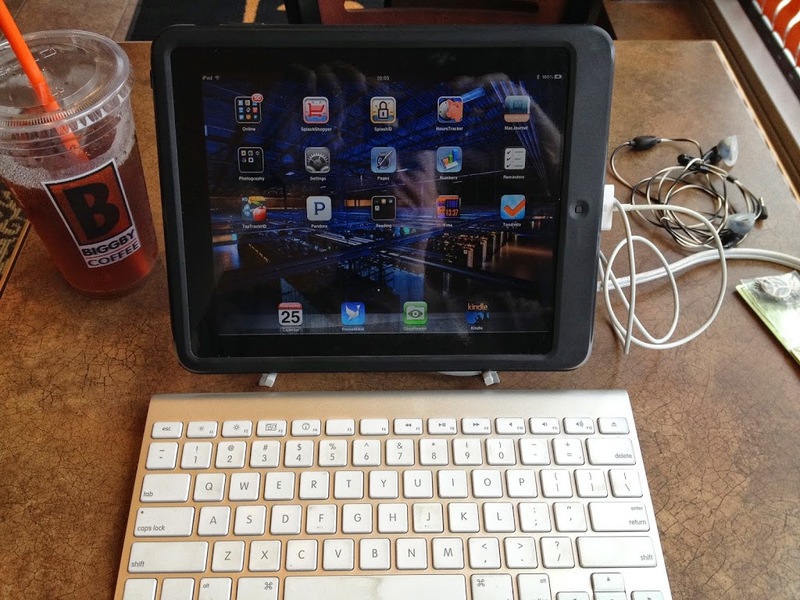 So, here’s the keyboard and the iPad. Here’s the table, the place, the time, and me. Please – join me, Lord. Hang out with me, as we laugh, think, consider, and as I learn a little more about You in the process. Thanks for the times you put up with me opening a God umbrella, and for Your faithfulness in walking with me, even when I’m a bit of a dufus and ignore you. Forgive that rudeness, Lord – I’m sorry. Thanks for your patience as I try to remember to turn to You, not just in the morning, but at all the crossroads of this day. Help me remember that though spending the very first moments of my day with You is great, spending every moment of my day with you is amazing. Welcome to the table, Lord. Please – speak. I’m listening.